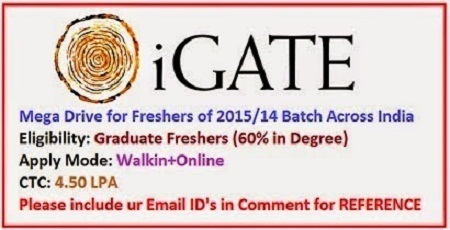 iGate is looking for freshers and experienced candidates. Want to apply for it? Now you can check it below. IGATE is an IT services company, headquartered in Bridgewater, New Jersey. The firm operates in North America, Asia, Europe, Japan and Australia, providing technology consultancy and services. Its revenues in 2014 were over US$1.2 billion, and it has a workforce of over 31,000. The firm has over 70 offices and customer delivery centers in North America, Europe, Asia and Australia. On April 27, 2015 French IT services group Capgemini unveiled a deal to acquire IGATE in a $4bn deal. In 2011, IGATE, acquired Patni Computer Systems–a company three times its size at the time. With a value of around a billion US dollars, this acquisition was the largest cross-border leveraged transaction in the IT sector. The acquisition was accomplished over 12 months, including the delisting of Patni from the Indian bourses and consolidating the shareholder value in the U.S. Initially. iGATE firm changed its name to iGATE Patni. It was changed to IGATE again on 7 May 2012. Its shares are listed on the NYSE as "IGATE". On 27 April 2015, Capgemini announced it would be acquiring IGATE, the transition would be completed over a phase of 6 months. IGATE CEO Ashok Vemuri announced his departure on 6 October 2015.